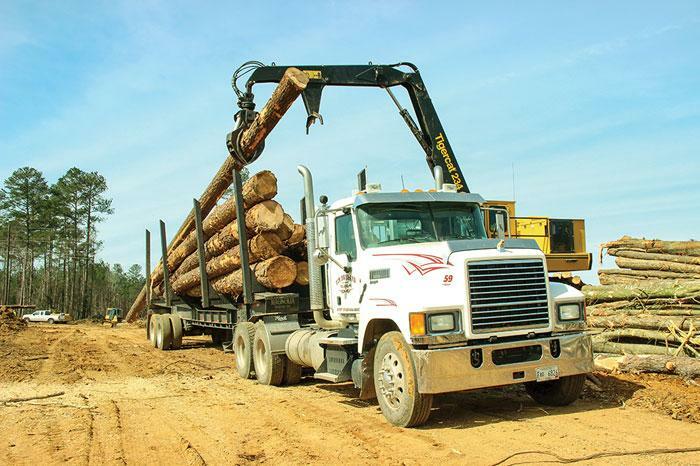 Southern Loggin’ Times magazine’s April 2017 issue features Philadelphia, Mississippi’s Performance Logging, Jamestown, South Carolina’s Nole Boys Logging, and Philadelphia, Mississippi’s Tim Breland Logging. 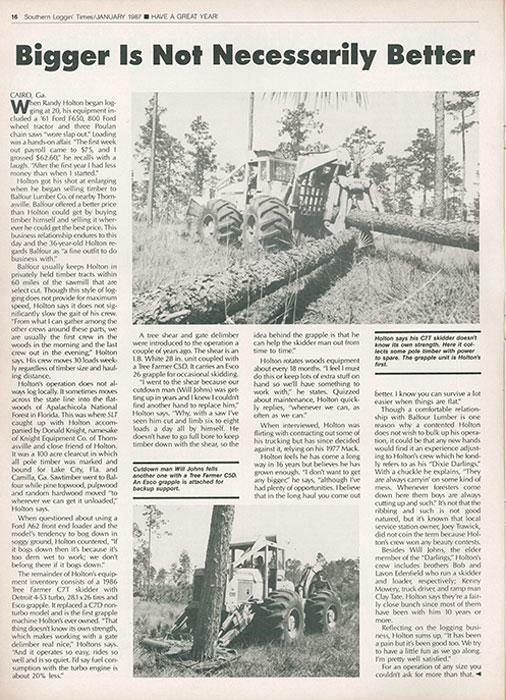 A special article highlights Brunswick, Georgia-based Tidewater Equipment Company and their 70 years in business. A collection of photos recounts Montgomery, Alabama’s J.M. Wood Auction Company’s recent 44th Annual Spring Auction. 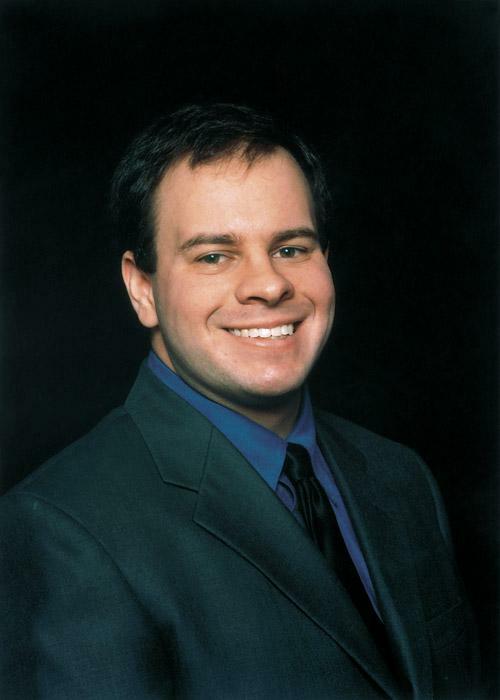 In the ‘Where Are They Now?’ column, SLT revisits Cairo, Georgia’s J.R. Holton Logging. Other articles cover the latest industry news, new products and upcoming events. Southern Loggin’ Times magazine Associate Editor Jessica Johnson visits Performance Logging in Philadelphia, Mississippi. Two days in a hospital’s Intensive Care Unit for a brain bleed will change you. 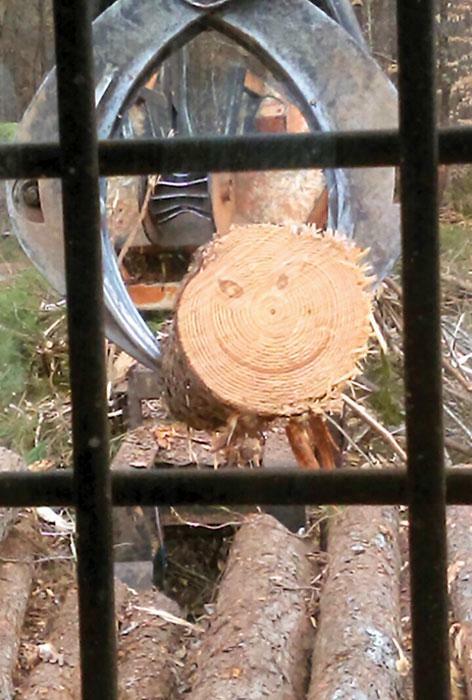 Or, in the case of Mississippi logger Drew Sullivan, it made him more committed than ever to keeping his job site as safe and as clean as possible. Sullivan says he doesn’t remember a lick of what happened that day, but he’s heard the stories about it from his dad, Gary, and his wife, Kelly. According to them, he was up on his loader, an old machine with leaks that often left it too greasy, when he slipped and fell, hitting the outrigger. Sullivan’s company Performance Logging had been in business for three months at the time. 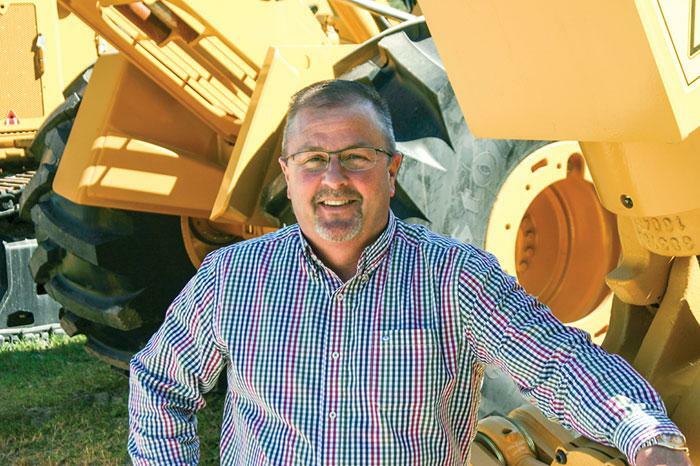 When the crew arrived for work later that morning, they found him rolling around on the ground under the loader, semi-conscious, and assumed he had a concussion. Southern Loggin’ Time magazine Associate Editor Jay Donnell travels to Jamestown, South Carolina to visit Nole Boys Logging. 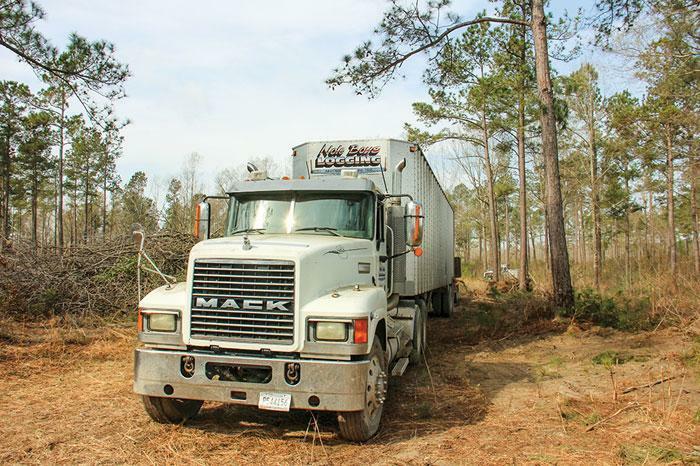 There have been many stories written about family oriented logging businesses, but it’s been quite a while since Southern Loggin’ Times has come across a company with as many family ties as Nole Boys Logging. Albert Nole, Sr. started the business in 1956 and today his three sons, Otis Albert “Sport” Nole, Albert “Stoney” Nole, Jr. and Alden “Master” Nole own the company together. When the trio took over the business in 2002, the business was 100% family oriented with all seven employees either being brothers, nephews or cousins on one crew. Nole Boys Logging has expanded quite a bit since they took over 15 years ago. Today, there are two crews composed of 22 employees, including truck drivers. 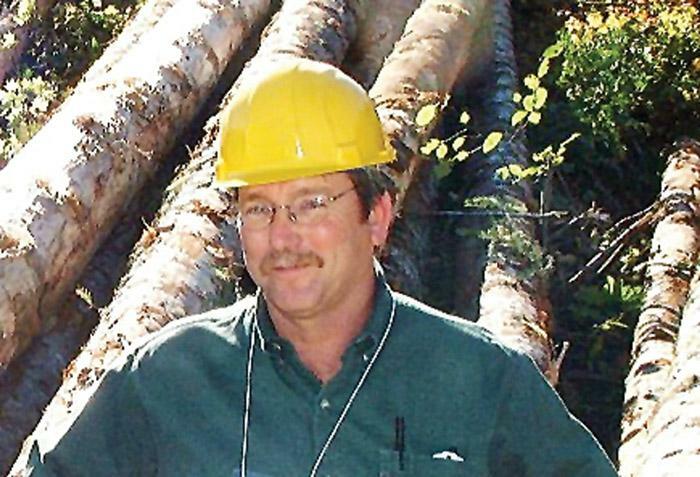 Southern Loggin’ Times magazine Managing Editor David Abbott has the opportunity to visit Tim Breland Logging in Philadelphia, Mississippi. Not all loggers come from a family of loggers. Tim Breland, 51, is a prime example. His father, Glenwood, was an entrepreneur of a different sort: he owned a line of convenience stores. Together, Glenwood and Breland owned nine stores in all spread out over a 60-mile radius in seven towns. By his early 30s, though, Breland knew he had no intention of continuing to follow in his father’s footsteps. “I was just burned out on it,” he says of the convenience store business. He adds that finding good employees was a constant struggle. “Finding good people to work in logging is actually easy compared to that,” he asserts. It was one big reason, he says, why the family decided to gradually sell off those stores upon his father’s passing 20 years ago. Southern Loggin’ Times magazine Contributing Editor Jordan Anderson visits Brunswick, Georgia’s Tidewater Equipment Company, who celebrates 70 years in business this year. 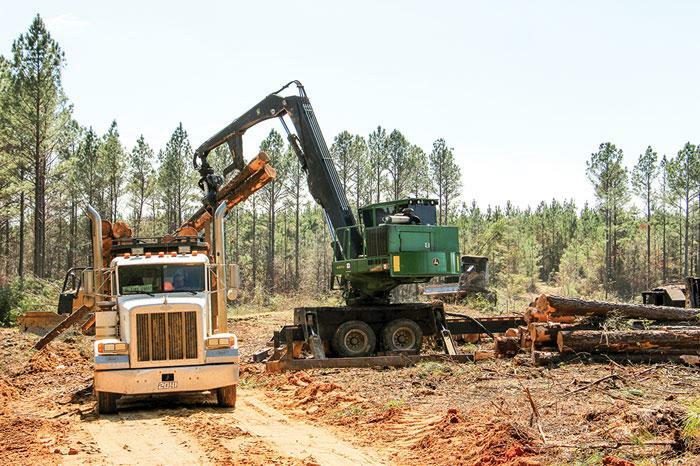 Founded by coastal Georgia entrepreneur Charles Whittle in 1947, Tidewater Equipment Co. today ranks among the nation’s largest logging equipment distributors with 16 locations in five southeastern states. 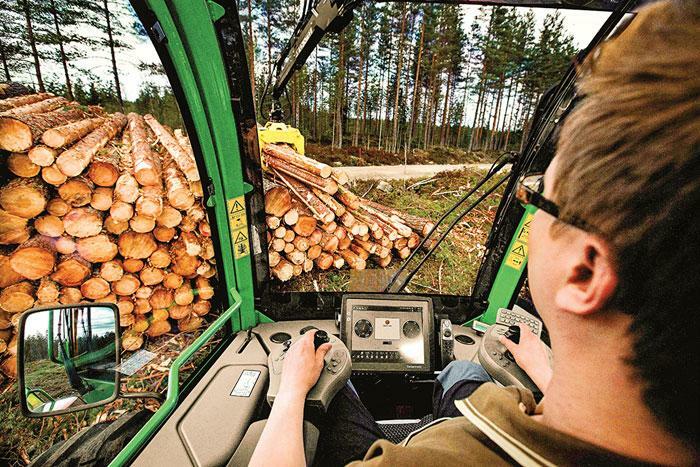 The company has existed longer than any of today’s leading manufacturers have made purpose-built logging equipment. It continues to grow, fueled by strong relationships with customers and manufacturers and leaders that emphasize faith, family and dedication to the job. Whittle started the company as a small manufacturer of tools for cutting and handling pulpwood. In the late ’50s and early ’60s Tidewater moved away from manufacturing and embraced equipment distribution, becoming a dealer for Bombardier, Franklin and Husky. Southern Loggin’ Times magazine Contributing Editor Jordan Anderson had the opportunity to attend J.M. 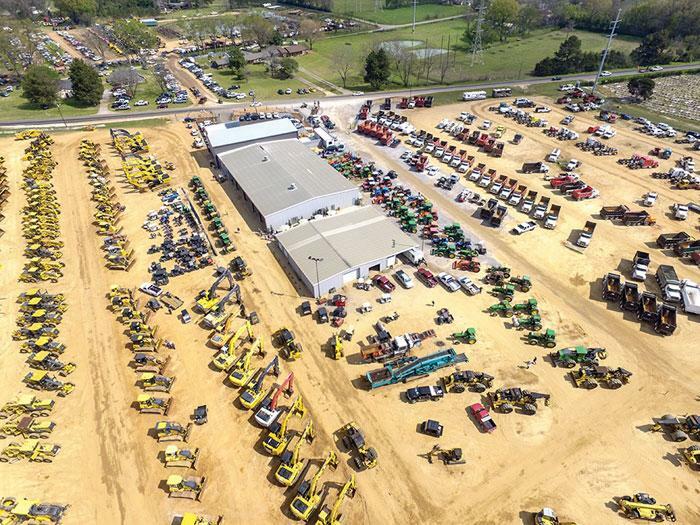 Wood Auction Company’s 44th Annual Spring Auction, held March 14-17 in Montgomery, Alabama. A collection of photos highlights the event.